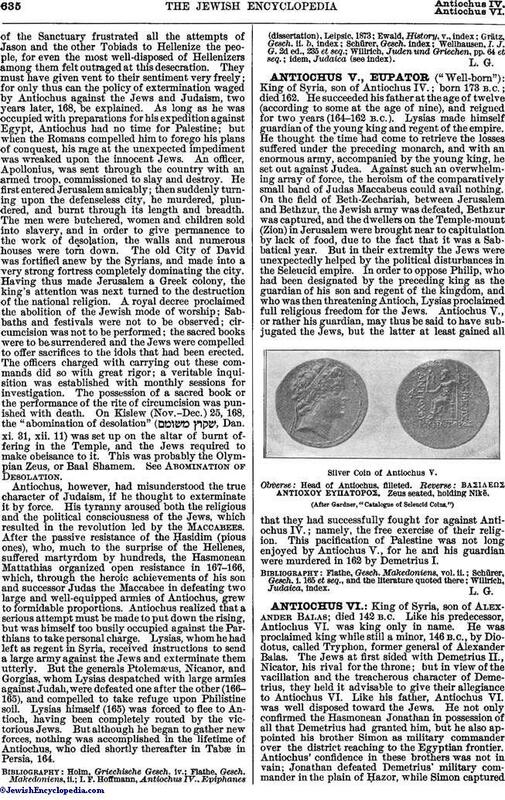 ("Well-born"): King of Syria, son of Antiochus IV. ; born 173 B.C. ; died 162. He succeeded his father at the age of twelve (according to some at the age of nine), and reigned for two years (164-162 B.C.). Lysias made himself guardian of the young king and regent of the empire. He thought the time had come to retrieve the losses suffered under the preceding monarch, and with an enormous army, accompanied by the young king, he set out against Judea. Against such an overwhelming array of force, the heroism of the comparatively small band of Judas Maccabeus could avail nothing. On the field of Beth-Zechariah, between Jerusalem and Bethzur, the Jewish army was defeated, Bethzur was captured, and the dwellers on the Temple-mount (Zion) in Jerusalem were brought near to capitulation by lack of food, due to the fact that it was a Sabbatical year. But in their extremity the Jews were unexpectedly helped by the political disturbances in the Seleucid empire. In order to oppose Philip, who had been designated by the preceding king as the guardian of his son and regent of the kingdom, and who was then threatening Antioch, Lysias proclaimed full religious freedom for the Jews. Antiochus V., or rather his guardian, may thus be said to have subjugated the Jews, but the latter at least gained all that they had successfully fought for against Antiochus IV. ; namely, the free exercise of their religion. This pacification of Palestine was not long enjoyed by Antiochus V., for he and his guardian were murdered in 162 by Demetrius I. Silver Coin of Antiochus V. Obverse: Head of Antiochus, filleted. Reverse: ΒΑΣΙΛΕΩΣ ΑΝΤΙΟΧΟΥ ΕΥΠΑΤΟΡΟΣ. Zeus seated, holding Nikē.